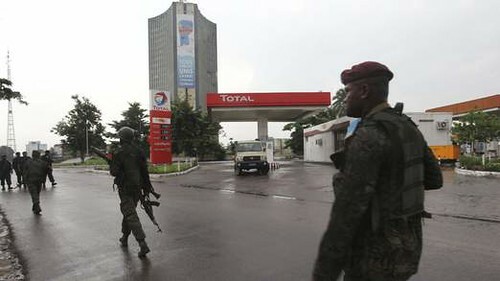 Government troops from the Democratic Republic of the Congo regain the state TV building and international airport from gunmen. Forty gunmen have reportedly been killed in fighting in the Democratic Republic of Congo capital Kinshasa a month after a peace deal was agreed with rebels. Government spokesman Lambert Mende said 40 of the gunmen had been killed by security forces, adding: "We have total control of the situation." Police had earlier put a security cordon around the state television building where gunmen had taken several hostages. Witnesses also reported shooting at the Tshatshi military camp. There were also reports of clashes between the army and supporters of Mr Mukungubila in the eastern mining city of Lubumbashi. The Democratic Republic of the Congo (DRC) has struggled to emerge from decades of violence and instability. It is home to a 21,000-strong UN peacekeeping mission. Before transmission was shut down at state television, two gunmen appeared on camera to deliver a political message against President Joseph Kabila, who took office in 2001 after the assassination of his father Laurent. The message said: "Mukungubila has come to free you from the slavery of the Rwandan." Mr Mukungubila, who calls himself "the prophet of the Eternal", ran unsuccessfully for the president against Mr Kabila in 2006. He has been an outspoken critic of a peace deal signed this month with the Tutsi-led M23 rebel group in eastern Congo.